Gerardus Pincemalge was a farmer and a verger (koster-Nl->Bedeau-î) in Zwevegem. He probably came from another village in the neighbourhood and get his function in the period of the inauguration on August the 28th 1606 of the new Lord of Zwevegem Floris de Griboval. We find him for the first time as a witness in the parish registers of Zwevegem on the 5th october in the year 1606. As far as we know he was unmarried at that moment. At that time the Southern Netherlands were under Spain and were ruled by the Archducs Albrecht of Autrich and Isabella of Spain. But Holland occupied Sluis (Zeeuws-Vlaanderen) and Ostend. By this way the protestants escaped to Holland blocked all oversea activities and Holland holded the Scheldt-Lisse linie under pressure. But in 1609 we have a truce (N: bestand, F:armistice) between the Spanisch Netherlands and Holland and directly the economical activity started again.The Archducs stimulated also the catholic reformation and it was the start of the Baroque churches in our region. But oversea activity stayed allways impossible.This prosperous period of 12 years ended in 1621 with the death of the Archduc Albrecht.The Archduc Isabella will die in 1633. This time was on the otherhand the socalled Golden Century of Holland. It's remarquable that Gerardus Pincemaelge married and had his children during that period (1609-1621). His youngest child Michael was born in 1620. Gerardus the "old verger" died in 1632 (one year before the death of the Archduc Isabelle) leaving behind his 5 minor aged children (less than 25 years old). Between 1618 and 1648 we have the thirty years war who devastated Germany. France occupied after 1640 also Artois and Cambrai and annexed this regions in 1659. THis 30 Years War ended with the peace of Munster and installed the supremacy of France for more than 200 years in Europe. Harvest ware sometimes good and weather was warm like in 1636/1637. But also pestepidemies came periodically up like in 1636 in the neighbouring village Bellegem and also in 1646/47in Zwevegem where ca 33% of the population died. We suppose that Michael stayed at that time with his mother at the parental farm and that she died in this epidemy. But after the epidemy of 1646/1647 live came up again like allways after this kind of disasters and the survivors took the open places. Michael married a first time with Joanna Terryn in 1647 and had his first child Maria june 1648. Joanna died 21 March 1653 in Zwevegem, Wvl, B. He remarried Anna Bevernaege 14 Nov 1653. At that time we see a shift in the family name in the parish registers going from Pincemaelge to Spinsemaille. Pincemaille was the variant allways used in the nearby Tournai and also Zwevegem belonged administratively to the diocese of Tournai. " S" pinsemaille means in dutch "of" Pinsemaille. We know that Michael Pincemalge died before 1686 from a map of 1686. 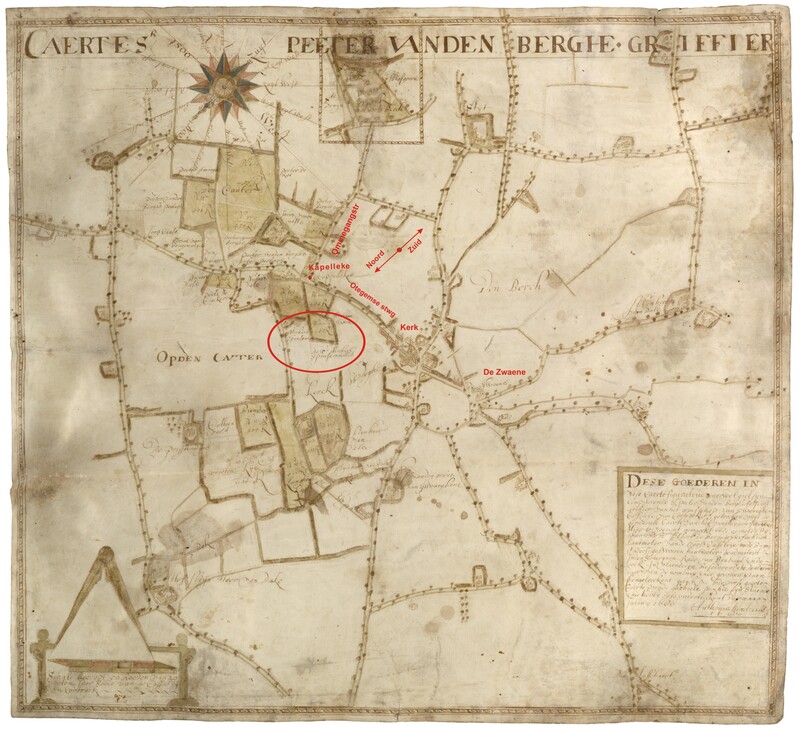 On this figurative map of 1686 we found grounds belonging to the widow of Michiel Spinsemaillie (Michael Pincemalge) and his son Michiel Spinsemaillie. That we find this goods near the church of Zwevegem is not really a surprise because Gerardus the father of Michiel Spinsemaillie sr (Michael Pincemalge) was as we have seen a verger (koster-Nl->Bedeau-î) in Zwevegem. remarks: this map is designed upside down, meaning North is down. Figurative map of a part of Sweveghem 20 Jul 1686. Nothing more is known about this son Michiel Pinsemaille , but we will follow the history of 2 other sons of Michael Pincemalge: Joannis Spinsemaille (1663-1726) and the youngest son Daniel Spinsemaille (1666-1737). You will see that they lived in their youth under the French occupation (1673-1678). The French king Louis XIV (1643-1715) became king under guardianship in 1648 but exercised his plain power from 1661 on. Our regions will then stay under continual pressure of France till 1713.